Looking for a natural way to reduce the appearance of dark, undereye circles? We’ve got it for you. Butcher’s broom—also known as “knee holly” and “Jew’s myrtle”—is a low, evergreen shrub that can give your eyes a plumper, more even look. In addition, this unique natural ingredient also helps moisturize skin, providing for a brighter, more youthful look around the eyes. Scientifically called Ruscus aculeatus, this shrub grows to about three feet high. 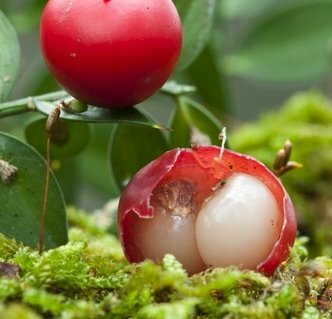 It’s thought to have been nicknamed “knee holly” because when mature, it can reach the height of a human’s knee. The leaves are evergreen and prickly, with tough, green stems that grow on the upper part of many short branches. Small, greenish-white flowers grow from the center of the leaves and blossom in spring. The shrub likes to grow in woodlands and hedgerows, and is tolerant of deep shade. It’s hardy, however, and will thrive in almost any soil type. You’ll also find it on coastal cliffs. The matured branches used to be bound together into bundles and sold to butchers for sweeping their blocks—hence, the name. The main benefit of butcher’s broom is vascular health. One of the major constituents of the extract (which most often comes from the root, though other parts of the plant may also be used) is called “ruscogenin,” and has demonstrated internal anti-inflammatory effects in the lab. Butcher’s broom may also help with conditions like constipation, leg cramps, and circulatory disorders. It’s also a mild diuretic, and can encourage the flushing of water from the body. Butcher’s broom is a wonder in eye creams. The properties of butcher’s broom help to temporarily reduce the appearance of unwanted darkness under the eyes. Components help fade appearance of dark circles. This is a great product for those with sensitive skin. When used topically, it is not linked with any type of irritation. Butcher’s broom can help with occasional itching. Cleansing around the eyes can also help them look more awake. The pore-reducing quality of butcher’s broom helps skin appear smoother overall, and is also beneficial for those with clogged pores and oily skin. Try our Anti-Aging Eye Cream and see if you notice an improvement in the appearance of your skin tone, under eye circles and puffiness. We’d love to hear about your results! Have you tried butcher’s broom? Share your experience with us in the comments! I had a subclavian aneurysm which I could feel. Horse chestnut and butcher’s broom resolved it. You didn’t see me saying the artery broke open, and then the herbs cured it. But I was at risk. It was the most fear I’ve ever, ever experienced. Vitamin K-2, magnesium, copper and several other nutrients are very good for the arteries. The acidic nature of the lemon juice dissolved the arterial calcification I had, which enabled the aneurysm to occur during heavy chest exercise because due to the calcification, the artery wasn’t flexible. Now in exercise my only limitation is the strength my muscles are able to generate—there is no circulatory discomfort. I cost Big Medicine at least a six figure payday. I recently had several internal infections, resolved in under 48 hours by dosing on cheap garlic. Yes, if you have a broken bone, see or call a doctor. I was applying it directly to my skin but the bottle says to drink it, has anyone else had good results by applying it directly to the skin? Yes, I’d noticed this cream had salutary effects on my under eye dark circles! It’s truth in advertising. Thank you, Annmarie! Yay we are so happy to hear it. And doesn’t it just smell wonderful when you apply it :).